The hardest part about painting is making yourself start. I still had gallons of recycled paint from my living room project. The equipment was out for the bedroom floors. Thanks to the pantry organization, all those cans and bottles on the counter had a place to be put away. I picked up a brush and started painting. By morning, my kitchen glowed! Meredith, it looks so fresh and pretty. I think yellow goes with everything. Good job! I really miss all those "fixer upper" projects you used to post about...like the motorcycle box table, etc. Thanks Connie. As we have settled in this house, I just don't have as much need for furnishings or decorative items as I once did. Though this house is 1600 square feet, most of it is open. It feels big, but doesn't have THAT many walls or places for furniture. Beautiful! I really enjoy warm colors and wish that I had your knack for color selection. It is really lovely. Oh, that is nice! I love how a fresh coat of paint can make a room sparkle. Oh I love it but then I am incredibly partial to yellow in any form. My entire upstairs hall is yellow and my family room. I have hints of yellow thrown into every room upstairs to tie it all together. Beautiful! You did an amazing job! It's so lovely and cheerful! Wow...what a difference the gold paint makes! It really warms everything up. Beautiful. 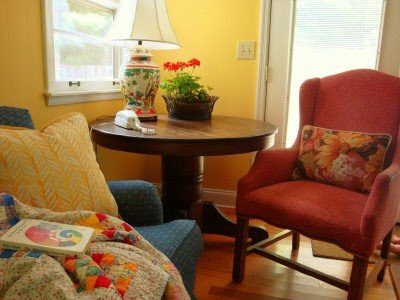 I love how you've used primary colors in your decor...but in muted tones. It looks great! That looks lovely! I bet your kitchen is even prettier (although that's hard to imagine). I've never told you this, but when I finally got around to plugging in my little coffee pot, I remembered yours in your kitchen on that little tray and did the same thing with mine. It makes it much easier to keep it all together. You not only inspire me in blogland, but the small touches in your home (that you probably don't even notice) inspire me still, all this time later. it's so much more YOU than the former cool color. I went to a new Christian Bookstore in our area the other day and the new owners had done a wonderful job with striking, beautiful paint colors throughout the store. I couldn't get over how simply changing the colors made the building look so much different than before. Your home is the same way. The new paint is just another "layer of lovliness" you've added, and is an inspiration. I honestly do not know how you get so much done with a baby and a toddler. Do you have help from family? I don't, and it seems impossible for me to get big projects like this done. If I were doing the painting, I would not only end up with a gold kitchen, but with a gold two year old as well! I love the color. I am in the process of painting my kitchen a soft buttery yellow and the cabinets white. I am working on the cabinets today. Your pictures are great inspiration. I can't wait to have my kitchen finished. Thanks for this post. I love the new look. It looks great! 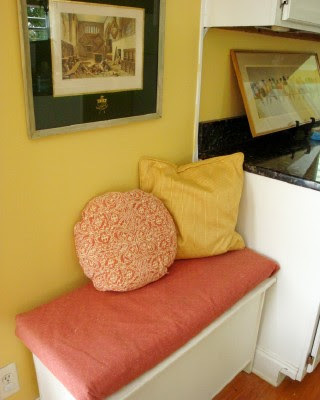 Just put a new coat of orange-y paint on a white bathroom here & am amazed at what a change in color can do. It looks so warm and happy! Honestly, the inability to paint and plant stuff are the main reasons I am tired of renting. Builders beige is *yawn*. Our spare bedroom used to be sunshine yellow, but we had to make it a little more masculine when our son was born. Now I'm longing to paint something yellow. Gotta look for a wall. The color is lovely. One of the things I love about gold is that it is a warm color that looks cozy in autumn and winter, and coordinates well with rust, red, orange and green for those seasons, so pretty at Christmas as a backdrop for holiday greenery, but so easily lightens and brightens for spring and summer. I love every post you make with that paint! I think it's a splendid color! You are right, STARTING is the hardest part of painting. How beautiful! We just painted our dining room & family room a similar color. We love it - it's bright yet warm and inviting. It's beautiful. I love the little seat by the counter. Very lovely! I have to have one room in my house that's some shade of yellow. This house, it's the laundry room. Very cheerful! I have a question. The small couch and table and chair... is that in a part of your kitchen that would be the eat in area? Do you use it as a living room or as a lunching room? If it is more of a living space, where does your family eat together? Formal dining room? Just curious because the idea of using my formal dining room more and turning my eat in breakfast area into a more relaxed loungy breakfast area is kind of intriguing. Charlotte, this *used* to be our kitchen/dining table from the last house. It belonged to my husband's grandmother. We have never had a dining room before this house. I decided that we would use it as our main eating area, and I use a table that's casual enough for every day in there. This kitchen opens to a room which most people might use as an eat-in area. But the four of us didn't need 2 places to eat, so I moved in a sofa and the little children's coffee table. There is a desk on the other side of the room. I still had that little table to put somewhere, so I moved it in the corner in lieu of an end table. I work there on my laptop most days. Love it! The room was pretty before but now it has the warm glow I associate with your previous decor. I'm thinking of painting my boys' bedroom since the paint is old matte finish and was just crayoned on. I think I know the blocking primer to use on it, but I'd appreciate any reader suggestions on good washable paint, preferably sation or semigloss vs. glossy. I love the warmth and sunniness it brings! What a fabulous project! Amen and amen! I keep telling myself that it is only paint, but I never have been very good at listening to myself!!! Meredith, it looks sooo pretty! I love yellow anyway - practically all my walls are yellow. I just think its a cheery color and I look at as a neutral. So very cheery. I want to make my house look like yours. So inspiring. Thanks, Meredith. I had been missing your decorating posts. I love your yellow walls. It's really so much nicer than the beige. All of this painting is inspiring me! We have had "test colors" of paint up on various walls in our house since last fall, waiting for us to decide, or for me to get off my rear and paint something. I love a bright cheery yellow but feared taking the plunge because of how bright it was. Your photo has given me some encouragement. :) Also, love the white floors and have some spaces that could use that too. Thanks for sharing! I love the color--it is simply darling! I am planning to paint some old bookcases this weekend, but I was dreading the process. You have inspired me. Thanks!